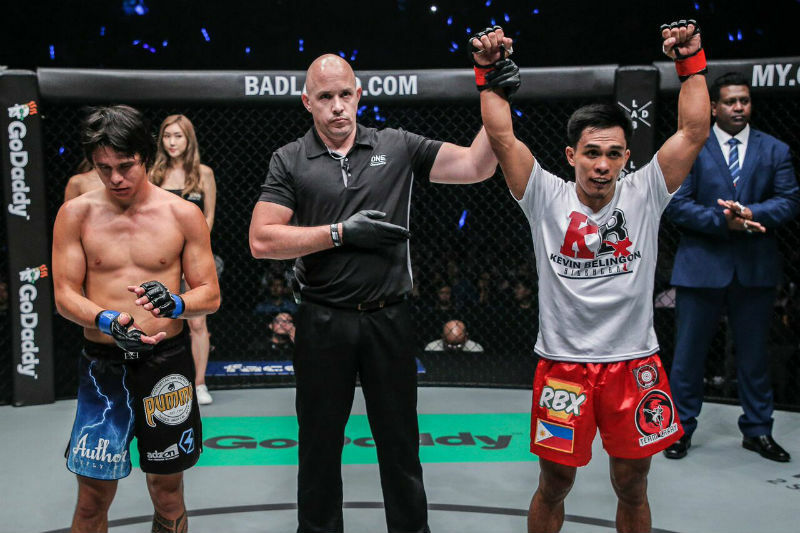 Kevin Belingon floored Reece McLaren in 62 seconds and Rene Catalan outworked Bu Huo You Ga to somewhat avenge the painful defeats of Edward Kelly and Robin Catalan during the ONE: QUEST FOR GREATNESS last Friday, August 18, 2017 at Kuala Lumpur, Malaysia. 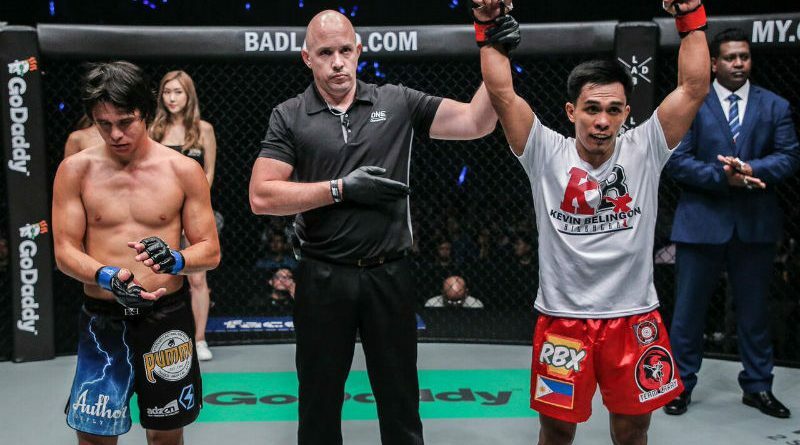 “The Silencer” Belingon came out smoking with vicious striking display against co-former world title challenger McLaren in recording his second consecutive stoppage victory. The terrific matchup of arguably the division’s most fearsome striker against one of its most skilled grapplers started with the two stars immediately trading punches at the center of the ONE cage moments after the first bell rang. Belingon misfired on a wushu side kick that elicit a taunt from McLaren. That goad, however, seemed to get Belingon more composed as he continued haunting his Australian adversary across the cage in one of the evening’s most anticipated clashes. While avoiding fall into a ground battle and deal with McLaren’s world-class grappling capabilities, Belingon found an opening as both men simultaneously attempted a punch. He landed a monstrous right hand to the chin of McLaren and send him crashing to the canvas. Belingon then went ground and pound and swarmed McLaren with an endless barrage of fists which the Filipino-Australian McLaren simply had no answer for. Belingon’s non-stop assault forced Referee Olivier Coste waved the bout off officially at the 1:02 minute mark of the first round. Just last April, Belingon trounced Finnish grappler Toni “Dynamite” Tauru with a stunning showcase of destructive punching power and was an impressive display of just how relentless Belingon could be. With the victory, Belingon improves his record to 16-5, winning his third-straight bout, while McLaren drops to 9-5. Belingon and McLaren have both competed for the title, each facing reigning ONE Bantamweight World Champion Bibiano “The Flash” Fernandes on separate occasions. This emphatic victory for Belingon should line him up possibly for another shot at ONE Championship gold, given how the bout ended. Edward “The Ferocious” Kelly ran out of gas to dropped a unanimous decision against the ONE debuting Emilio “The Honey Badger” Urrutia. The four-year MMA fighter Urrutia did not disappoint in his fir ONE cage bout. He bucked a slow start to tame Kelly via a unanimous decision. A beautiful side kick to the head from Kelly started the action, followed up by another two kicks which kept Urrutia at bay. A number of kicks kept Urrutia from a distance until he got close and immediately took the fight to the ground. Honey Badger then controlled the top game for the next few minutes, but Kelly eventually pushed away and the two were back to their feet. As the round came to a close, the Team Lakay standout had slowed down a bit, but was still trying to utilize his effective kicks. Urrutia, an SFC Bantamweight Champion, immediately brought the match back to the floor as the second round began and jockeyed for position inside Kelly’s guard. Urrutia continued to rain Kelly with blows from the top to control the action. Urrutia landed a knee to Kelly’s head in the dying seconds and then attempted a kimura but couldn’t complete the submission as the bell sounded. Urrutia brought the action to the ground once again after a touch of glove to start the third round. Urrutia was able to locked in two hooks on Kelly’s back during a scramble and worked for a submission. Kelly, however, managed to sweep him and wind up in top position. With the win, Urrutia pushes his record to 10-4. Kelly gets his three-bout win streak snapped, and drops to 9-4. Rene “The Challenger” Catalan brilliantly thwarted takedown attempts of Chinese wrestler Bu Huo You Ga to earn the nod of the judges in a bout that went the distance to somewhat ease the pain of the brother Robin’s TKO loss to Dejdamrong Sor Amnuaysirichoke. Catalan remained composed as Chinese Greco-Roman Wrestling Champion came out with a spider-like crawl across the cage to get the bout underway. He instead fired a perfectly-timed left hand straight down the middle to send him tumbling to the mat. The 38-year old Catalan then started to apply a strong ground and pound attack but the fallen 25-year-old Chinese exploded out of the bottom to reverse positions. Catalan then weathered Bu Huo You Ga’s north-south choke attempt and flipped over to get back on top again to end the round. Bu Huo You Ga quickly moved in for a beautiful double leg takedown that planted Catalan on the canvas. Catalan, however, sneaked in short elbows from the bottom, forcing his opponent to stay in constant motion and avoid taking any serious damage. Much like the previous exchanges on the ground, the two continuously reversed positions, with each one landing on top in an attempt to impose dominance. Eventually, the Chinese grappler got back on top as he looked for short, powerful punches while burying his head into Catalan’s chest as time ticked away in the round. The third started with a clinch before Catalan beautifully reversed a takedown attempt. Bu Huo You Ga got underneath a leg to drag the match to the ground but the Filipino overturned the positions to land on top once they hit the mat. Catalan ended up moving into full mount before looking to take the back but the Chinese competitor used his Greco-Roman Wrestling expertise to wiggle free and completely flip positions yet again. The back-and-forth battle ended with Bu Huo You Ga attempting to wail away with strikes from the top, but the final bell sounded before he could land anything significant. The win hikes Catalan’s winning streak to three and improves his professional record to 3-2 with a no contest. Bu Huo You Ga drops to 4-3. It was bitter-sweet night for Catalan, who had to coach younger brother Robin get knocked out later on the same card. 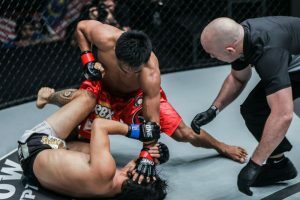 The 27-year-old Robin sprinted to an early advantage and brought the crowd to its feet as he got underneath Dejdamrong Sor Amnuaysirichoke, elevated him into the air and brought the Thai crashing back to the mat with a powerful slam in their strawweight bout. A scramble ensued and Amnuaysirichoke was able to recover and get back to his feet where he gets the edge because of his world-class Muay Thai striking. Catalan, however foiled any damaging attacks before the round came to an end. The second round was a different story. Immediately the second round bell sounded, Amnuaysirichoke went after Catalan then lock him up in a Muay Thai clinch on the feet. From there, he unloaded with rapid-fire knee strikes and elbows. Even when Catalan crumbled to the mat, Amnuaysirichoke kept the blows flying forcing referee Yuji Shimada to stop the contest just 46 seconds into the frame. Amnuaysirichoke’s impressive win is his second win in a row while trying to get back into the ONE Strawweight World Title picture. He elevates his record to 8-2 while dropping Robin Catalan to to 6-3.